Jerusalem - Celebrated British physicist Stephen Hawking has pulled out of a June conference hosted by Israel's President Shimon Peres, joining an academic boycott of the Jewish state, event organisers said on Wednesday. "Hawking joined the academic boycott of Israel and pulled out of the Israeli Presidential Conference: Facing Tomorrow 2013, under the auspices of President Peres," they said in a statement. 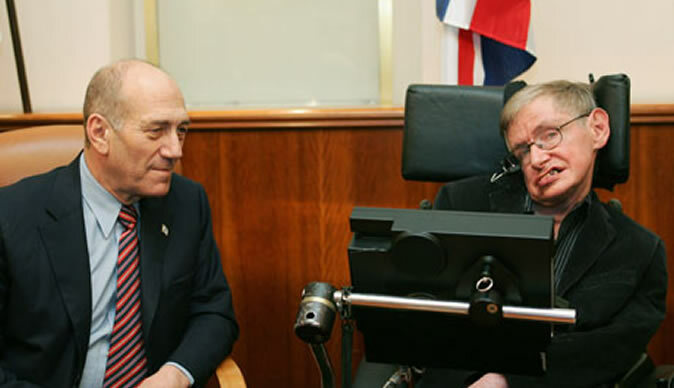 The British Committee for the Universities of Palestine (BCUP), which supports the academic boycott of Israel and opposes its occupation of Palestinian territories, said Hawking had decided to observe the boycott and as a result had "declined his invitation". "This is his independent decision to respect the boycott, based upon his knowledge of Palestine, and on the unanimous advice of his own academic contacts there," it said on its website. Britain's Cambridge University, where Hawking has worked since 1962, confirmed he had pulled out, but initially said it was for health reasons. "Professor Hawking will not be attending the conference in Israel in June for health reasons - his doctors have advised against him flying," a university spokesperson told AFP. However, BCUP later confirmed Hawking had endorsed its statement that his reason for pulling out of the conference was indeed a boycott. "The statement above has been issued with the specific endorsement of Professor Hawking's office," it said in a statement added to its site. Conference chair Israel Maimon slammed the boycott as "outrageous." "The academic boycott against Israel is in our view outrageous and improper, certainly for someone for whom the spirit of liberty lies at the basis of his human and academic mission," he said in a statement. The 18-20 June conference will host diplomats, politicians and academics, and its speakers include former British prime minister Tony Blair, ex-US president Bill Clinton and American songstress Barbra Streisand.